Hello! I am a Sweet & Sassy stuffed octopus and I am just sure that we will be friends for life. I have a wonderfully huggable body of soft vibrant pink fabric that is variegated with a dash of peach and white as well as a hint of lavender. So pretty! My eyes are big and colorful, but it's my tentacles that you are just going to adore. I have two lavender, two periwinkle, two lime, and two teal, all that curl so nicely and sparkle with beautiful silver specks. And check this out... 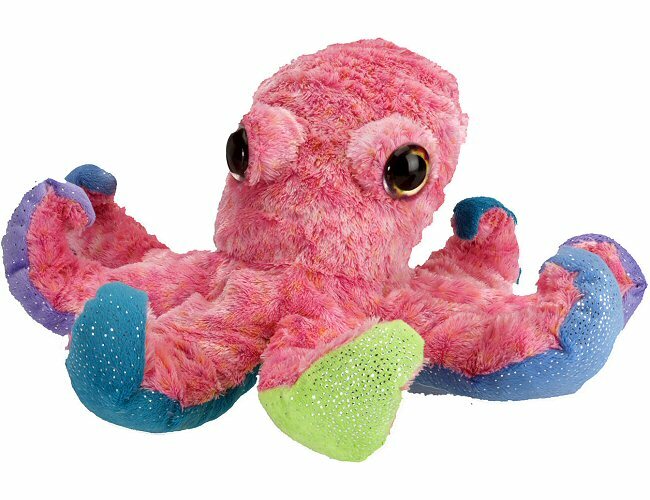 When you purchase me (aka Sweet & Sassy plush octopus), a portion of the proceeds helps to provide housing and education for disadvantaged children, as well as protection for abandoned animals throughout the world. It's definitely a win - win - win situation! This adorable little octopus stuffed animal keychain has soft turquoise and light blue fur and fun, springy legs. Plush octopus Krakers has awesome curled tentacles, a huggable body, and soft deep blue and light blue fur. Blue Raspberry, this adorable Li'l Sweet & Sassy plush dolphin, has soft blue fur and pink accents with shiny silver flecks.